We had to get up at the crack of dawn (but of course it's already light there) and board a boat which took us to Haines. Interestingly, from Skagway to Haines via roads is 330 miles but via boat it's less than 1/2 hour. Pretty wild! 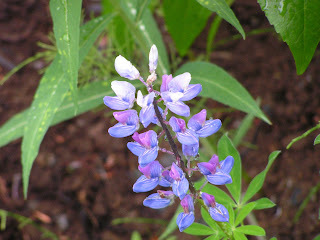 We visited a wildlife sanctuary which was a lot of fun. 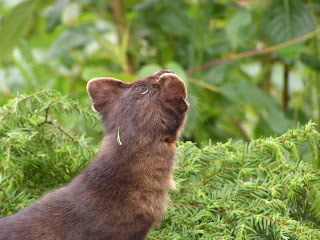 We saw wolves, moose, lemmings, a pine martin (shown below), porcupines and millions and millions of mosquitos! 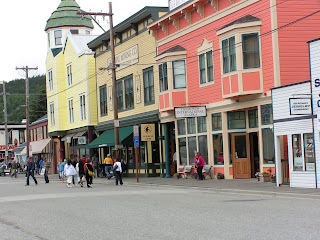 Then we returned to Skagway and did some shopping in the quaint little town. And the best part? I found a yarn store (thanks Lisa!) and bought some Qiviut. It is unbelievable expensive so I only bought one skein but it is true Alaskan yarn and is amazingly soft. It is from the under wool of the Arctic musk ox. Definitely something you don't find every day. I can't wait to make something out of it. Skagway is an adorable little town that looks like an old west town. What great pictures. I am having Alaska envy. I bet that yarn is womderfully soft. I was wondering what that thing was. And in the pines, no less. What a cool vacation! Yes it Really Is that Bright! What to do - What to do!